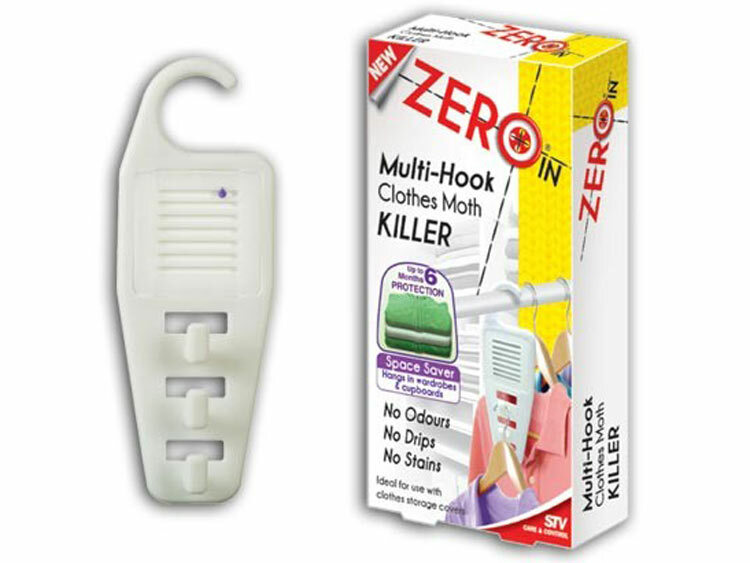 The Multi-Hook Moth Killer is designed to protect your clothes from expensive damage by moths their larvae and eggs for up to 6 months. It also offers a multi-hook space saving system that gives the benefit of increased hanging space in wardrobes. The unit is particularly ideal for protecting against moth damage to clothes stored within clothing covers. Simply remove all the product packaging and insert the Moth Killer unit into the multi-hook system and place in the desired location. One unit protects an area up to 0.5 cubic meters;(corresponding to 1m (H) x 1m (W) x 0.5 m (D)). Set the product-life indicator by sliding the marker to the month. The unit needs replacing, 6 months after first use.